IoT in general and Big Data in particular has been a top concern among many businesses globally in 2015. While some IT industry think tanks like Gartner keep viewing IoT as one of the main digital trends for 2016, the chance is slim that the Internet of Things will go mainstream in the corporate world next year. Factors that are keeping the IoT industry from booming and evolving at a rapid pace are pretty clear, but we've decided to approach our Twitter followers and ask them to name today's one biggest impediment to the IoT adoption within organizations. We've received 92 answers from some of the most active Twitterers and would like to share our survey results with you. No surprise, most of IoT / digital experts we'd polled - 45% - pointed to "security and privacy issues" as the main gatekeeper to the IoT evolution. Further, 23% pointed to "lack of standards" and 15% of Twitterers named "lack of decision makers' understanding of IoT and buy-in" as the top reason holding back the IoT mass adoption. Yet, 13% of the Intersog survey participants mentioned other IoT inhibitors (see below). Are you looking to build an IoT solution and in need of professional advisory on spec, required resources, and monetization? Are you on Twitter? Why not follow us @Intersog to join more interesting and thought-provoking discussions around the IoT, Big Data, Cloud, eHealthcare / Telehealth, mobile tech and more! 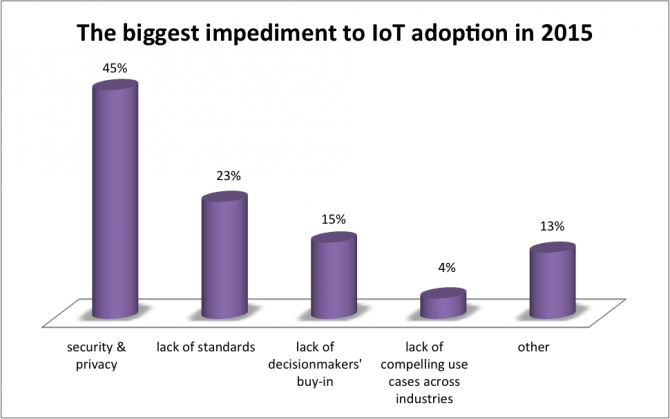 And what do you think will be the biggest inhibitor to the IoT mass adoption in 2016?